The idea for this image originated in a project to paint personifications of the classical elements. 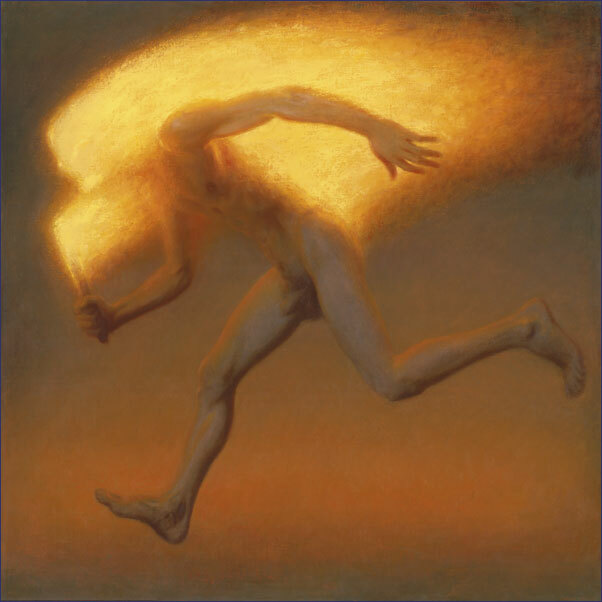 The element of fire was the only one that – rather literally – took legs and ran. Doing justice to the subject has become an obsession, leading me through several versions; standing to begin with, but becoming ever-more dynamic. I’m rather proud of the compositional strength and dynamism of this version, built so firmly on the diagonals of the square, and centred on the groin – the fulcrum of the figure’s energy. As for the disturbing, demonic character of this figure, I’ve had very mixed feelings about it. Sometimes images emerge that are compelling but that leave one at a loss to understand the source and nature of their power. He may be an image of human evil, or perhaps an expression of our modern zeitgeist with its apocalyptic nightmares of global warming. I thought of calling him Lucifer – ‘Light-bringer’ – but became wary the moral judgements such a title might inspire. More recently I’ve come to see a perverse joyfulness in this figure that, in truth, I admire. Perhaps certain aspects of painting itself are bound up with his incandescence: he has to spread his flame, to set others alight.